Make sure you have an empty storage device connected to your player (USB memory stick, or SDCard). It must be formatted with FAT32 or ExFAT. If the storage device is not empty the installation process will not work! Make sure the player ethernet cable is connected, so the player can obtain an IP address. You will need a computer connected to the same network as the player to remotely access the BrightSign player web interface. We strongly recommend using a firmware version 7.1.75 or above. BrightSign firmware can be downloaded here. Have your player HDMI connected to a display. Press the "Reset" and "SVC" buttons simultaneously at connecting the power cable to the BrightSign player. Release the buttons as the ERR red light starts blinking fast. IMPORTANT! Remember to use an empty storage device on your player! Wait as the player boots. The BrightSign menu will appear on the screen with instructions. Using a computer or tablet, open a browser and enter your player's IP Address. On the bottom, click on “Use current settings". Click on “"Next" to get to the "Publishing options". Firmware: Although older firmwares are supported, we strongly recommend using version 7.1.75 or above. The installation might take a while depending on whether a firmware update is required. Wait until it is finished. The setup is completed when the OnSign TV App is shown on the device’s screen. 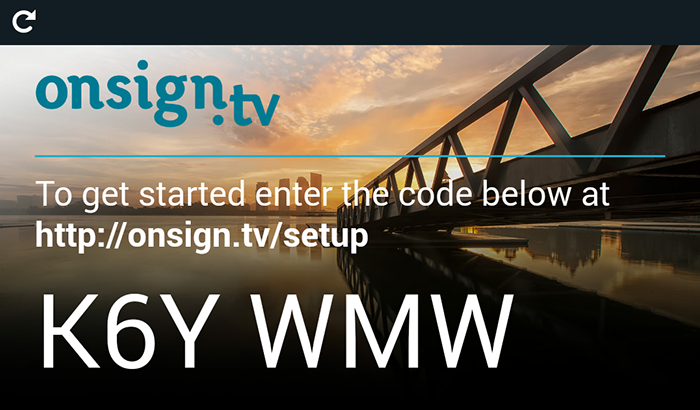 Next step: Learn how to connect your device to your OnSign TV account.